Who can’t love a book about words?! Not I. But then again, without Noah Webster to catalogue and decipher them, we may not have this book, either. When my daughter came home from preschool (!) several years ago touting words like ovoviparous ,I knew I had another wordhound on my hands. She also learned omimous from PBSKids around the same time, both of which I didn’t even know till I was much older. Okay, I confess, I had to look up ovoviparous that spring in Pre-K when Kelly was trying to educate us on chicken eggs. Yes, that was a dinnertime conversation and yes, Jim and I looked at each other with equal parts awe and scrutiny. Did our barely 5-year old really just utter that big ol’ word? 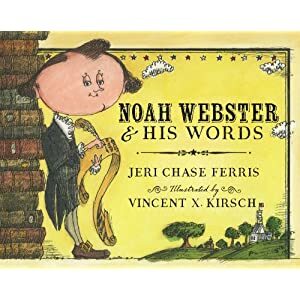 Delightful for just about anyone, from teachers and parents and kids, to those young at heart, NOAH WEBSTER AND HIS WORDS is a true gem, highlighting not just history but also a love for the written word. What I found that really stands out with this book is the way the author has pulled several words away from the text to highlight their definitions, such as SCHOLAR and CONFIDENCE, among others. It is sort of reminiscent of Jamie Lee Curtis’s book, BIG WORDS but with a definite historical–biographical bent. If you get the book, talk about the words. Oh gosh…you could just pull directly from the book and try to use them in a sentence, for the rest of the week, forever. If there’s something you don’t know–by all means, look it up! Use this book as an opportunity to expand on words your child already knows, share a love for writing (and speaking) concisely. Encourage kids to ask questions and seek answers in the dictionary–whether in hard copy form or on-line. It’s also a wonderful tool to talk about one’s passions. Noah Webster, for exaple didn’t want to become a farmer like the men in his family–he wanted to become a scholar. Talk with your child the costs and benefits to going against the grain, against the family business, and perhaps doing something radical–but within limits. About the book on Ms. Ferris’s website, awards, etc. What a darling book! Set in the 1930s with the most beautiful illustrations by Erwin Madrid to accompany, MY YELLOW BALLOON is a children’s book destined to become a classic to help children deal with and process grief. No where in the book does anyone die, which I especially appreciated–knowing full well that the book can be adapted to include the loss of a lovey (blanket, toy), to a pet, and family member or friend, MY YELLOW BALLOON talks about loss in an honest, engaging, and reassuring manner. Six-year old Joey is at the fair with his parents when he plucks a yellow balloon from a fair worker, he and balloon become close–friends, even. They do everything together until one day, Joey looks up and sees his precious yellow balloon floating up, up, up into the forever blue sky. The illustrator does a beautiful job of showing–with color, or the lack thereof–Joey’s feelings and emotions. MY YELLOW BALLOON is the perfect book for just about anyone dealing with grief on any level. This week, THURSDAY, NOVEMBER 20th just happens to be Grief Awarenss Day for Children. Why not make this book part of your family time? While you may not be dealing directly with death, this is a fantastic opportunity to discuss–and prepare–for complicated emotions that are sure to plaque anyone in the face of loss. Tiffany Papageorge has always had a profound love for stories. She earned her MFA in Acting from the American Conservatory Theater in San Francisco. Through her extensive theater background, which spans a 25-year period and includes work with CBS and Disney, she learned firsthand how stories deeply touch and affect the human spirit. As an author and public speaker she works with parents, teachers, and mental health professionals who want to find new ways to reach, capture, and engage children, including those who are dealing with the issue of loss. She also works with children directly through story to help them grow, heal, and flourish. She and her husband, Paul, live in Los Gatos, California, with their three children. My Yellow Balloon™ is Tiffany’s first children’s book. I bought this book mostly because I love children’s picture books…and the main charcter, Kate Sessions happens to share her name with my daughter who is also a tree-loving little girl, although my hubby so kindly pointed out, she may be outgrowing picture books. I disagree. Anyone and everyone can love picture books; they are truly a wonderful foray into the world of literature. And so my love for children’s literature never dies. 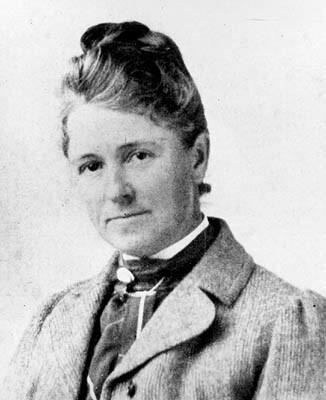 And neither does San Francisco, which was once dry and desert-like and has been transformed in a lush green garden by Kate Sessions who was quite visionary for a time in which women–and girls especially–were seen and not heard (and often, not educated). 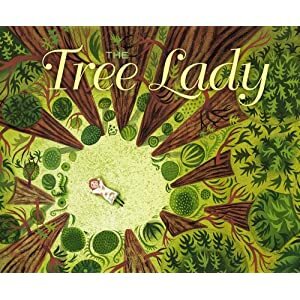 Part environmentalism, history, biography, and girls-can-do-anything motto, THE TREE LADY will change not just a city forever, but you too. What kinds of adversity do you think girls had to overcome in the mid-late 1800s? Is there something you are equally passionate about that you could put into action just like Kate Sessions did? What if there were no trees? What if Kate Sessions didn’t have this vision for San Francisco? How might it be a different city? Did you like the story about Kate Sessions and her drive for trees and green space in San Francisco, or did you like the illustrations best? Maybe both. Can you think of other women leaders who have had to overcome criticisms to do what they were passionate about? Do you think Kate Sessions had a good life? Why or why not? Every one of John Hendrix’s illustrated history books for kids are a delight, hands down. Some may claim they are not “just for kids” but adults alike. Although SHOOTING AT THE STARS is a fictionalize account of the Christmas Truce of 1914, the horrific and dreadful events are very real. Yet, Hendrix can weave a dire situation into a beautiful tapestry of words and art, one which will truly resonate with your family for years to come. Piecing the story together with journal articles, interviews with actual soliders, Hendrix manages to artfully brush the voices of the past with that contemporary love for the holidays. Best for older children–mine are 7 and 9–and also for those who have an innate fascination with history, this book is sure to please everyone in you family, from the young to the old, generate talking points for discussion, and perhaps even suspend your own beliefs about what is the true meaning of Christmas. For more information on John, his work, and more click here.